Today marks the first death anniversary of esteemed Senator Miriam Defensor-Santiago who, despite her moods and temper, was dearly loved by the public for her honesty, and most certainly her fearlessness. Miriam was known for three things: courage, smarts and humor. She was courageous with her public statements that were, more often than not, too passionate for her own good. She was the cream of the crop and had international achievements to back this all up. She also had the corniest pick-up lines that only she could deliver in a funny way. But beyond the witty remarks and her storied career, Miriam was a league of her own, a lone beacon of excellence and integrity in Philippine politics. It’s been a year since we’ve lost her, but she will remain a part of the public’s hearts for a long time because Miriam never gave up on the country even when death was knocking on her door. Yes, she struggled with stage 4 lung cancer, and even though she was cured at one point, she never surrendered and died a fighter. To pay tribute to the president we never had, we’ve compiled some of the most memorable moments of Asia’s Iron Lady, Miriam Defensor-Santiago. We just couldn’t get over the time when Miriam publicly scolded then-private prosecutor Vitaliano Aguirre so bad that the lawyer, who is now the Justice Secretary, had to cover his ears during the Corona impeachment trial. Aguirre was later cited for contempt then escorted out of the Senate. Another of Miriam’s victims was Atty. Arthur Lim, who was also part of the prosecution team during the Corona impeachment trial. Like Aguirre, Lim was overpowered by the Senator’s feisty attitude paired with her masterful knowledge of the law. Miriam was once again schooling the prosecution team over technicalities regarding their case when she suddenly coined her popular “Wha” expression, which was meant to show downright disbelief. There’s also the “kagaguhan” term that Miram infamously blurted out during the impeachment trial after she got insulted by the prosecution’s move to withdraw five articles from their impeachment case. It was, of course, later erased from the Senate’s records. Former police chief Alan Purisima was absolutely no match against the lady Senator when she blew her top while questioning him over the details of the Mamasapano massacre, where 44 elite cops had been killed in a botched operation in 2015. Miriam’s punchline? “Kung hindi ka siguro nakisali doon baka buhay pa sila.” Ouch! Even Janet Lim-Napoles wasn’t safe from the savage remarks of Miriam when she was being questioned during the Senate probe on the pork barrel case. 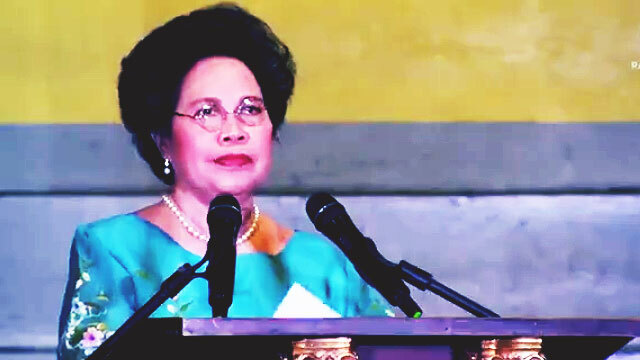 Although she was calm, Miriam delivered some comments on Napoles’ Catholic background with hints of sarcasm. Ilocos Norte Rep. Rodolfo Fariñas and Senator Antonio Trillanes IV got a first-hand taste of Miriam's wrath when she returned to the Senate despite having stage 4 lung cancer only to be questioned by the two lawmakers. Miriam had a lot of highlights during the debates and although she was clearly struggling with her health, she made sure to deliver her points in a clear and concise manner while still maintaining her humorous nature. In one of the presidential debates, Miriam delivered a moving closing statement, where she said she would never quit serving the country despite the odds stacked against her. Arguably her most memorable statement. This embodied her resolve as a fearless woman who would never compromise her integrity.